Taipei, Dec. 7 (CNA) Premier Lai Ching-te (賴清德) said Friday that he will step down from the post "when the time is right" to take political responsibility for the ruling Democratic Progressive Party's (DPP's) rousting in Nov. 24 local government elections. "Taking political responsibility is the supreme value of democracy that no one should ever go against. I am a person who preaches 'long live democracy,'" Lai said in a press conference at the Executive Yuan. Pressed with questions about whether he has considered it to be a right timing when the Legislature breaks for a recess in January or running for president in 2020, Lai didn't elaborate. The legislative session is scheduled to end Dec. 31, but an extra session is likely to be held in January if the 2019 budget bill is not passed by the end of this session. Lai offered a verbal resignation to President Tsai Ing-wen (蔡英文) on election night. He said then that the election result was a reflection of public dissatisfaction with the government's performance, for which he has to shoulder responsibility. As his resignation was not accepted by Tsai, who resigned as DPP chairperson that night, Lai has decided to stay put "in the interest of political stability and continuity." Lai said on Nov. 26 that he would remain in the post because he was scheduled to deliver a report on the Oct. 21 Puyuma express train accident to the Legislature the next day and has to continue the Cabinet's efforts in pushing through the 2019 budget bill and other bills. At Friday's press conference, Lai said that he accepted Tsai's offer to take up the premiership in September last year, against advice from many of his friends, because the government was already in a bit of a predicament at that time. "I wanted to help, but it turned out a year later that it didn't work out well," Lai said. Lai said he decided to stay on as premier, irrespective of the criticism heaped on him, which, according to him, was "not for my own good, but rather for the interest of the whole nation." "I am utterly resolute in stepping down when the time is right to shoulder political responsibility. What we have learned from the elections about our mistakes will surely be addressed and not be just empty words," Lai said. 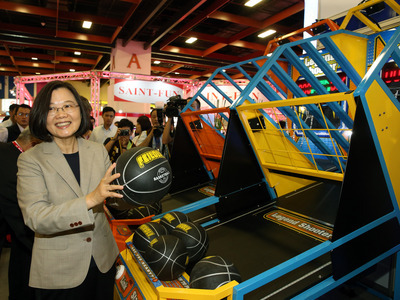 He added that only when he resigns as premier can Tsai have room to embark upon her agenda in a more vigorous way. The heavy losses in the elections have led to squabbles among DPP officials over who should be the next party leader, as well as over issues such as whether Tsai should adjust her reform agenda and whether a major reshuffle of the Cabinet and Presidential Office staff should be undertaken. At the press conference, Lai also presented a report detailing what the Cabinet saw as causes of the public dissatisfaction with its drafting and implementation of policies. In response to Lai's press conference, the Presidential Office released a statement in which it said that Tsai and Lai have achieved a high degree of consensus on how to adjust policies, how to reshuffle the team, and the pace of advancing policies. Since the elections, Tsai and Lai have had intense exchanges of ideas and they both understand each other's thoughts, the statement read. "The president commends Lai for being a premier with strong sense of responsibility. Lai's decision to take the post and continue to perform diligently after the elections has been made for the interests of Taiwan," it said.